Karen Stockin with one of Massey’s two dolphin research vessels. 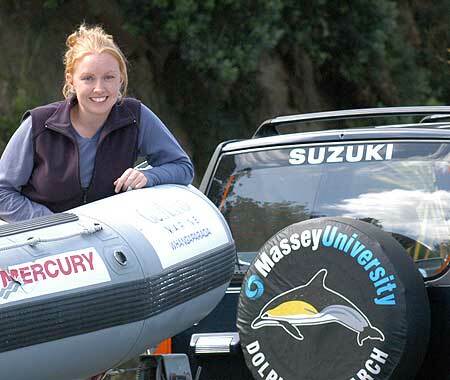 Research on the New Zealand common dolphin has earned Massey marine biology researcher Karen Stockin the sole New Zealand nomination for a 2009 United Nations Educational, Scientific and Cultural Organisation (UNESCO) fellowship for women in science. It is the second time Ms Stockin has been selected as the New Zealand nominee for the prestigious UNESCO-L’Oreal co-sponsored fellowship for young women in science. Fifteen fellowships are awarded every year, each worth $52,000 over two years. Recipients will be announced this September. Ms Stockin says if she succeeds in gaining a fellowship, the funds would assist with her postdoctoral research on the common dolphin in New Zealand and Australia, and its significance as a biological marker of changes in the marine environment. Currently a research officer and lecturer in the Coastal Marine Research Group at Massey’s Institute of Natural Resources in Auckland, Ms Stockin’s just-completed doctoral research on the New Zealand common dolphin provides the first substantial scientific data on the species. Ms Stockin says the species has been overlooked by researchers as a result of false assumptions based on the dolphin’s name. Despite being labelled common, it is in fact not nearly as common in terms of its abundance as some other species of dolphin. Her zoology doctoral thesis, The New Zealand Common Dolphin – Identity, Ecology and Conservation, provides an understanding of the biology and status of the dolphin and investigates the impact of tourism, commercial fishing and marine pollution on the species. Ms Stockin, who has recently been mentoring dolphin researchers at Flinders University in Adelaide, is also to develop New Zealand’s first common dolphin management plan for the Department of Conservation. New Zealand’s National Commission for UNESCO describes Ms Stockin in its statement of recommendation for the fellowship as “an outstanding role model for young women in science”.